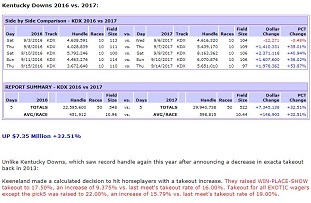 "In what would be a significant change in how 2-year-old races and stakes races are conducted in the United States, 20 of the leading tracks announced plans April 18 to phase out the use of race-day medication beginning with juvenile races next year and then adding listed and graded stakes beginning in 2021. The proposal to end the use of furosemide (Salix, commonly called Lasix) has support from some leading industry groups but also saw opposition and concerns raised by horsemen's groups and regulators. Lasix is administered to prevent exercise-induced pulmonary hemorrhage, but its use is out of line with other major international racing jurisdictions. On Thursday, a coalition of leading Thoroughbred racing organizations announced plans to move closer to that standard. Coalition racetracks that signed on to the initiative include all tracks owned or operated by Churchill Downs Inc., the New York Racing Association, and The Stronach Group, as well as Del Mar, Keeneland, Lone Star Park, Remington Park, Los Alamitos Racecourse (Thoroughbred meets), Oaklawn Park, and Tampa Bay Downs. Taken together, the tracks represent 86% of graded or listed stakes races in the U.S. in 2018." It seems a bit unreal to me that fear of what PETA can do, and not vision from within, might turn out to be the catalyst for change. Imo, if you're going to do away with race-day meds, a phase out, as opposed to a one time outright ban, is the way to go. The following statement was distributed to media Thursday afternoon as an “open letter” from Stronach Group chairman and president Belinda Stronach following the track's 22nd fatal breakdown during morning training at Santa Anita. Where have all of the so called racing journalists gone? Last week, when The Associated Press picked up the story about the situation at Santa Anita, their reporters wrote about microfractures. "These are orthopedic failures, not single-step failures. The horse didn’t step in a hole. The horse didn’t take a bad step," she said. "If you bend a paper clip back and forth 200 times, then put it back in shape so it looks brand new and hand to me, the next time I bend it, it might come apart in two pieces even though I insist I did not bend it hard. That’s how these fractures occur." It starts with a microfracture. Then a small, partial fracture. Finally, in the heat of a big race or perhaps just a light training session, the bone shatters. It seems sudden, a fluke. "This is really just the normal physiological consequence of an increasing workload," Lyons said. "Take a human runner. Most runners know that when they increase their distances and then say, ‘Boy, my shins were killing me last night after a run,’ that they need to back off for the next week. They need to let it heal. What they do with horses is give them anti-inflammatories without a diagnosis, then keep training and racing." Lyons said new technology is being developed that would allow a CT scan to be performed in a matter of minutes on a horse’s front and rear legs, which could be a revolutionary step forward in equine medical care. But the industry must be willing to pay for the machines, which are expected to cost about $300,000 apiece. Also, there must be enforcement in place to ensure that when a potential problem is discovered, the horse is kept off the track until fully healed." 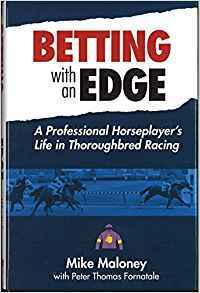 I find it interesting -- alarming -- that none of the so called racing journalists writing about the situation at Santa Anita have even mentioned the word microfracture. The CHRB has been compiling data on fatal breakdowns and microfractures for years. Is there not one racing journalist out there who's willing to write a hard hitting story connecting the dots? BloodHorse.com is reporting Santa Anita will cut purses for its stakes schedule. I know that industry decision makers in California (owners, trainers, track management, CHRB Commissioners, etc.) don't want to hear it. It ought to be obvious to everybody by now that SB 1072 has been a complete disaster - and that a change in direction is needed. 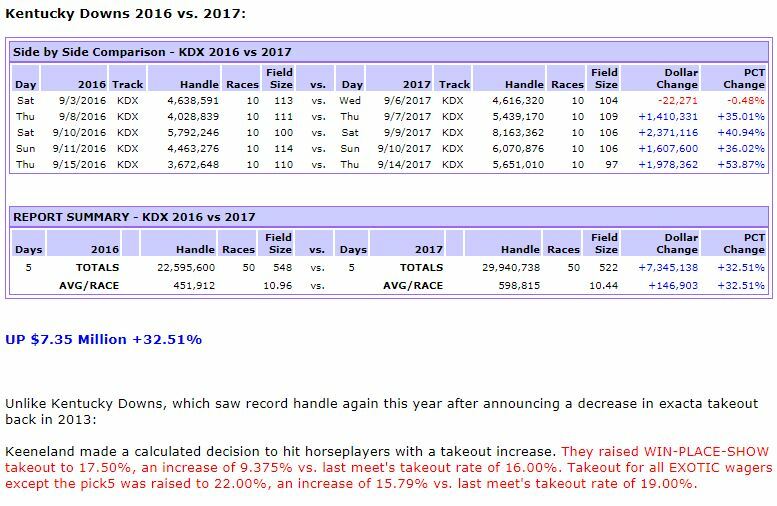 In my opinion, the ONLY way thoroughbred racing in California is going to generate increases in purse money is to generate increases in money BET by horseplayers on the product. The question isn't whether or not horseplayers were right about SB 1072 being the wrong thing to do. 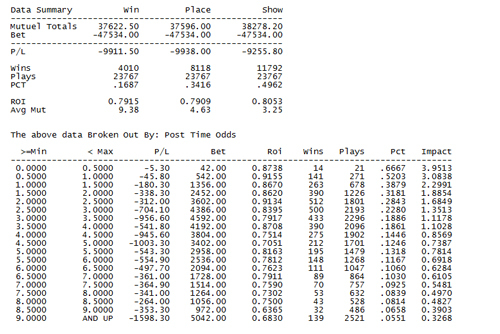 How do we get horseplayers to bet more money on the product than they are betting now? Me: stepping down off of soapbox. Today's picks for closing day at our #1 rated racetrack Kentucky Downs by Emily Gullikson are now available. Kentucky Downs lucked out with the amount of rain they received from the remnants of Hurricane Irma, and so today's card is a definite go. The final program of the five-day meet has ten races, including the Franklin-Simpson Stakes (race eight) and the Ramsey Farm S. (race nine). More from OPTIXNOTES and OPTIXPLOT can be found at OptixEQ.com.